Residents have been allowed to return to their homes after a huge wildfire spread close to their properties in Sutherland. In total five residents from 11 properties, deemed to be at risk near Durness, were taken to hotels on Monday at about 19:00. Firefighters have described battling "tinderbox" conditions for four days in the area. Residents were returned to their homes later on Monday night. Six fire appliances from Ullapool, Wick, Durness, Thurso, Bettyhill and Lochinver were sent to the incident. Highland Councillor Hugh Morrison, who owns the Smoo Cave Hotel at Durness, described the conditions. "The fire came within 30 yards of some of the homes - it was only the road that was between them and the blaze. "A number of people left because of the risk. But some decided to stay. There was smoke all over the place - it was quite a problem." He added: "The problem is that the wind was so strong - up to 50mph. The ground has been so dry and there has been no way of stopping the fire. "It is like a tinderbox. Some of that heather has not been cut in 20 years - it is not only dry, but very long." Fire crews had begun tackling the flames on Saturday and had left the area about 06:00 on Sunday after a 20-hour battle. However, they were forced to return hours later after the blaze re-ignited across a two-mile front. Fire crews have also been battling wildfires near the village of Kinbrace in Sutherland and another near Auckengill, close to John O'Groats. 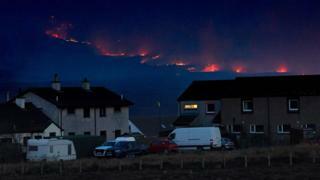 In Ayrshire and Moray, further wildfires were tackled when large grass fires took hold.